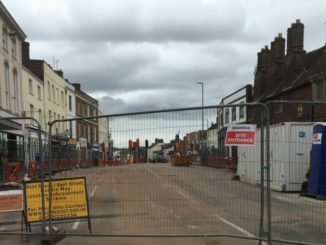 Plans for major improvements to a key junction in Taunton are taking shape with dates and details of road closures now finalised. The junction where East Street and East Reach meet Hurdle Way needs to be fully replaced as the traffic lights are so old that any major fault could make them irreparable and lead to major disruption. Work will start on Monday 6 June and should take around eight weeks. To complete it as quickly as possible, East Street will be closed in both directions from its junction with East Reach to the Market House roundabout. East Reach and Hurdle Way will be kept open, but traffic will also be prevented from turning right from East Reach into Tancred Street. 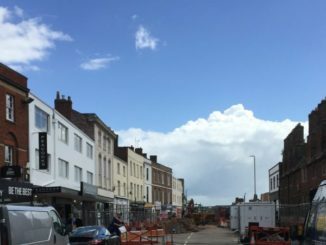 As East Street will effectively be pedestrianised during the closure, the County Council, Taunton Deane Borough Council and others are looking at opportunities to use the road for stalls or events. It is hoped stalls will be lining East Street as part of Somerfest which takes place on Saturday 18 June. And in July there are plans for an international market and an arts market. “The decision to close East Street has not been taken lightly, but we’ve looked at the options and believe this is a better alternative than a much longer scheme with disruptive temporary traffic lights in place on Hurdle Way and East Reach which are key arterial routes. 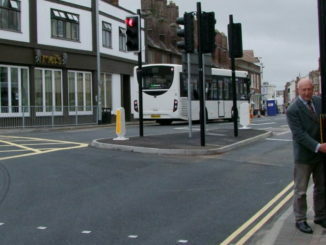 East Street has been closed in the past and it should allow traffic to continue flowing through this important junction. It’s likely to take people a few days to get used to the closure, so please be aware and plan your journeys carefully. “We recognise and are fully supportive of the proactive approach being taken to deal with this critical work essential to improve a key junction in the centre of Taunton. The upgrade will see all equipment at the junction replaced, and the layout of the junction will also be improved to reduce the number of pedestrian movements crossing Hurdle Way from three to two. The new traffic signals will run on extra low voltage supply and use LED lights which are more energy efficient and cheaper to run. The junction and approach roads will also be resurfaced with high friction surfacing towards the end of the scheme. View a plan of the proposed changes and a road closure map by visiting www.somerset.gov.uk/eaststreetclosure.